Pulled my CMU200 out of storage after a long time sitting and it seems to have developed a start up issue. 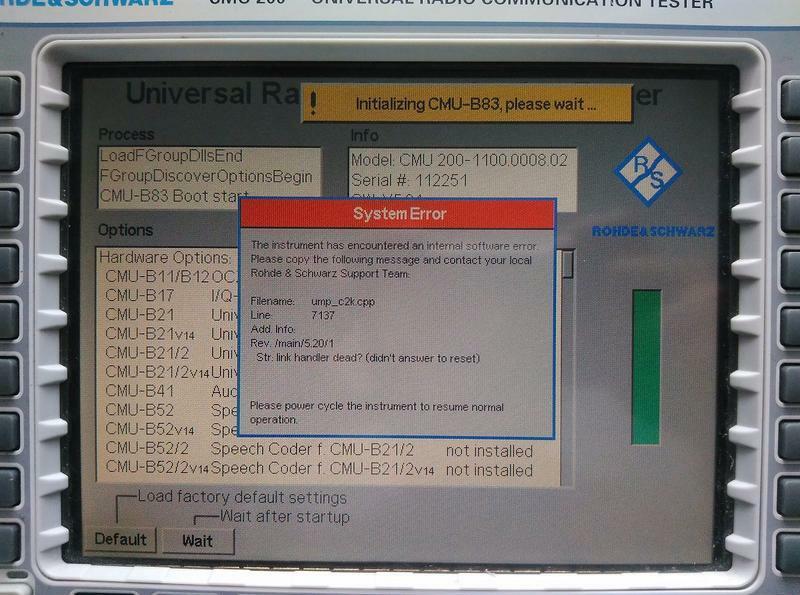 I'm getting a System Error whenever the unit initializes the CMU-B83 module (CDMA2000 apparently). At first glance, it seems like a driver or something corrupted itself which is odd. Tried reverting to an earlier version of software, loading default values, etc, etc, but no go. Maybe there's a Rohde & Schwarz guru out here who may be able to answer this. I'm wondering if its possible via some menu somewhere to selectively load modules (i.e. bypass loading the CMU-B83 module on startup just in case that's what is causing the problem). So far I've only found mention in the manual of being able to do this post start up, but that kind of defeats the purpose. I'm no expert but we use our CMU200 at the club all the time and I've had to deal with a few of its quirks. I'd definitely recommend taking a look at the HDD. It's an old IDE 2.5" located behind the front panel and I wouldn't be super surprised if it might be slowly going out. While you inspect it I'd also recommend imaging it because it's a pain and a half to try and reload all the software onto a new drive should it crash. In terms of support, if you don't find answers here the EEVBlog forums have a great test equipment section with a lot of guys who know a lot of things about the CMU200. Best of luck! Looks like you've got a unit that hasn't had its LCD shielding glass go yellow which is real nice. Fantastic. Thanks for the good info. I'll take a look at that group as well as the hard drive. Would be nice to have a backup of everything at any rate. Definitely a great unit for the money. Picked this one up a few years ago when they could be had for a couple hundred dollars and up until now had been a great deal. Even had a fresh calibration. Seems like the prices on them have gone up though, interestingly. Would be nice to keep it around for awhile yet! Same advice here, I used an old copy of Norton's Ghost 8.0 to image mine, took snapshots of the HDD in case it fails later. There is a utility Ghost comes with that you can use to pick out individual files from the backup as well, and that would give you the ability to restore or copy an individual corrupted file. FWIW, you probably won't be able to swap HDD from another unit and expect it to work; I tried "upgrading" one by plugging in a copy of a better-equipped unit and although it did boot, none of the hardware option boards came up, so it reverted to a VERY basic unit with no additional features than those the plain mainframe gives. They have some form or DRM or serial number control that prevents this, and I pretty much gave up on the idea. However, you might be able to substitute the .CPP file from another unit without major conniptions. Good to know. Any particular tricks to get to the HDD? Manual makes it sound like its simple as removing the case and a few covers but it seems like there's a lot more to it than that. Figure it might be nice to preemptively swap it out and have a backup - especially with what you're saying, that you can't just install a new one with the right options. Any particular tricks to get to the HDD? Manual makes it sound like its simple as removing the case and a few covers but it seems like there's a lot more to it than that. I had one of these (have since sold it and moved to a Tek RSA603B), but I did replace the HDD in mine with a CF card. I used DD to copy the drive to a file (and backed it up), and then wrote that file with DD to a CF card. A CF to 2.5" IDE adapter was used to replace the drive in the unit. If you move to a CF card, make sure you use a SLC card rather than a MLC card as those are not designed for this kind of use and will wear out and fail quickly. SLC CF cards are from Swissbit and are expensive (~$100), but MLC cards are from SanDisk/Lexar/etc and are cheap (~$20). The CMU200 runs DOS and through a normal motherboard with BIOS, so it is quite forgiving unlike instruments that run VXworks/etc that have a picky HAL and care about sectors/etc. Perfect. I had originally opened things up but didn't see the drive right away so wanted to make sure I was going the right direction before I started tearing into it more. Guess I'll be removing some cards then. Thanks for all the good advice from all those who have replied so far! You shouldn't have to pull cards. With a few screws the drive pulls out, I don't remember, but maybe I had to detach the front panel from the instrument to get to the drive, otherwise it's accessible without pulling a bunch of cards, IIRC. It's a standard 2.5" IDE laptop HDD.